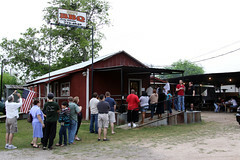 My visit to Snow’s BBQ was part of the Central TX BBQ Run. After a very successful Friday of BBQing and food-trucking, day two of the Central TX BBQ Run started with a trip to Snow’s BBQ in Lexington, TX. 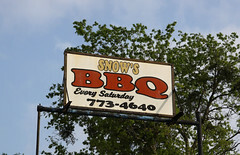 Snow’s is a modest little BBQ joint, but got catapulted to fame back in 2008 when Texas Monthly gave it a Best BBQ in Texas award. It’s been popular ever since, and their 300 pounds a day BBQ soon found itself surprisingly popular, and increasing their production four-fold. So it was only natural that a group such as ours would go seek out Snow’s. However, going to Snow’s is a bit of a logistical issue, since they only serve from 8 until noon on Saturday (they are closed the rest of the week), and they frequently run out of food, sometimes as early as 9:30. That means that if you aren’t taking it home, that means barbecue for breakfast! Also, the line forms well before they open, so if you want to make sure you get a good spot in line, that means getting up early. So we got up at 6am in Austin so we could get there before opening. One hour and 40 minutes later, the first members of our group arrived in Lexington. It’s a small town, basically a cross-roads with a few side streets, nestled into farm country. There’s something satisfying about eating brisket when you can hear cow’s mooing. So we pulled up at Snow’s, and got in line (yes, even at 7:42, there was a healthy line formed). By the time their 8am opening rolled around, the line stretched to the street, even with them starting to serve early. And the line had a lot of people that were obviously searching Snow’s out from afar. Several other people with cameras in line. Several of them with BBQ judging sheets as well. And even another aficionado sporting a Roscoe’s House of Chicken n’ Waffles t-shirt. Luckily, once Snow’s opened they were pretty efficient with their serving line. Quickly our group found itself in the door. 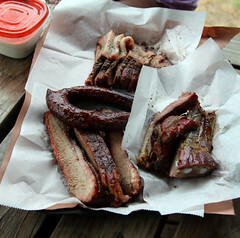 Our lead party bought our typical pile of pile of meat: Brisket, sausage, and ribs. The brisket was all it was made out to be. Perfect smoke line. A great rub resulting in a nice bark. Tender meat with the fat just starting to render. In short, this was excellent brisket, and one of the high points of our trip. They’ve got that dialed in pretty well. It was so good I opted to get even more meat in the form of a brisket platter, served up with some good beans, some even better cole slaw, and some damn fine potato salad. Eating all this before nine in the morning made this a true breakfast of champions. As far as the rest of the meats? The sausage was good but not stellar (they don’t make it there, it comes from City Meat Market down in Giddings, our next stop), with a slightly tough casing and a rather loose filling. And the pork? Disappointing, in actuality. A little tough, and it had an odd note to it. Which brings up an important question? Was it worth it? I certainly don’t regret getting up at 6am to drive out for a BBQ breakfast. The brisket was indeed seriously good, one of the best we had on the trip. 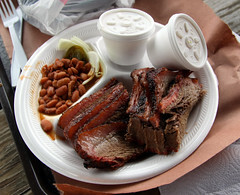 But compared to the across-the-board reliabilty of, say, City Market in Luling (be patient, I’m writing that one up as well) and the quality and accessibility of Franklin BBQ (again, review coming! ), it’s really, really hard to say that it’s worth the drive out there for just that. To be honest, Dennis, I think one of the other diners in my party coined that phrase. But it was awesome.